WASHINGTON, D.C. -- While France, Germany, Italy and Spain agreed last week on a plan to stem migration across the Mediterranean, the European Union as a whole still lacks a common migration policy. Finding a policy that everyone -- particularly the public -- can accept will likely continue to prove elusive in the near term: No other region of the world is more divided on Gallup's new Migrant Acceptance Index than the EU, where scores range from a high of 7.92 in Sweden to a low of 1.69 in Hungary. Maximum possible score on the index is 9. Gallup created the Migrant Acceptance Index to gauge people's acceptance of migrants based on increasing degrees of personal proximity. The index is based on three questions that Gallup asked in 139 countries. The questions ask whether people think immigrants living in their country, becoming their neighbor and marrying into their families are good things or bad things. The higher the score, the more accepting the population is of migrants. With a Migrant Acceptance Index score of 5.92 (out of a possible 9), the European Union as a whole scores just slightly higher than the global average (5.29). But within the region, the scores largely follow an East-West divide. Along with Hungary, other Eastern European countries such as Slovakia, Latvia, Czech Republic, Estonia and Croatia are among the 10 least-accepting countries in the world. Sweden and Ireland are the two EU member countries among the 10 most-accepting countries. Expanding this list to include the 20 most-accepting and 20 least-accepting countries, Luxembourg, the Netherlands and Spain join Sweden and Ireland, and Bulgaria, Lithuania and Romania join their counterparts in Central and Eastern Europe. Top EU countries of destination for migrants, such as Germany, the United Kingdom, France and Italy fall lower in the rankings, but all of them score above the EU average. The divide between EU countries in Central and Eastern Europe and those in Western Europe illustrates the chasm that exists in public attitudes toward migrants within the EU and the struggle it faces to create a cohesive policy: The index score for EU countries in Western Europe is 6.73, compared with 2.77 for EU countries in Central and Eastern Europe. 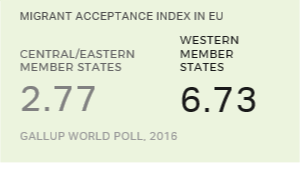 Although Migrant Acceptance Index scores vary widely across the European Union, there are common threads among those who are solidly more accepting of migrants -- in line with what Gallup finds in most regions of the world. Acceptance generally rises with education, and those in the highest 20% income group -- who are also more likely to have higher education -- are more likely to be accepting of migrants than those in lower income groups. Maximum possible score on index is 9. Younger generations in the EU are most accepting of migrants, while older people are the least accepting. Those in the postmillennial generation are the most accepting of all. Traditionalists -- the oldest generation -- are the least accepting of all. Despite the huge gap in index scores between EU countries in Western Europe and those in Central and Eastern Europe, within these regions, migrant acceptance tends to be higher among these same demographic groups -- the youngest generation, those with more education and those with the highest income. However, scores among even the most-accepting EU populations in Eastern Europe are about half as high as scores among the least-accepting EU populations in Western Europe. If the European Union hopes to make progress toward achieving a common migration policy, then it will require more unity and cohesion on the issue among member states -- two items that the data would suggest are not in abundant supply across the bloc. Finding common ground will be difficult, not only because of the wide range of views on how to manage migration flows, but also because of the wide range in public acceptance of migrants -- and the lack of acceptance in Central and Eastern Europe in particular. John Fleming contributed to this analysis. These results are based on telephone and face-to-face interviews with approximately 1,000 adults, aged 15 and older, conducted throughout 2016 in 138 countries and in 2017 in the U.S. In some countries, such as India, Russia and China, sample sizes are much larger, between 2,000 and 4,000 adults. For results based on the total sample of national adults, the margin of sampling error ranges from ±2.1 percentage points to ±5.6 percentage points at the 95% confidence level. All reported margins of sampling error include computed design effects for weighting.